I started using Google+ on July 31st. I saw other photographers getting really stoked about it and I wanted to give it a try. At this point, Google+ was only open by invitation, so I reached out and Martin Bailey was generous enough to give me an invitation. I started using Google+ right away and haven’t looked back since. I love Google+! I like the way photos appear on this social medium and I like how it incorporates Circles of friends, family, acquaintances, and colleagues. You can really funnel down to whom you want to send messages. But the best of all is the rapid growth my Google+ account realized since I started. In just 2 1/2 short months, the number of people that have me in their circles already exceeds all my Facebook friends! This is nothing short of amazing to me. Well, we are just about ready to say goodbye to 2010 and hello to 2011. Can you believe it? Looking back over the past year, I have assembled some great photographic memories. Some are recorded for posterity in digital format, some of which you can see on my website. Other memories are etched in my mind and consists of terrific shots missed or great people I’ve met over the past year. 2010 has been a photographic blast for me! In this end-of-season madness, I find myself doing some things that are important. I just upgraded my old wireless network router to a 300Mbps N Gigabit router. The main problem I was having on my network were IP address conflicts and slow speeds. I hope the new router will rectify these annoying problems. Upgrading equipment is important. I still have about 500 GB of empty space on my Drobo, so an additional hard drive is on the short order list. I am still working on the Photoshop CS5 learning curve, which is pretty steep and will take me some time but will be well worth the effort. All photo print orders have been fulfilled and it was a good year for me. I continue to learn the ins and outs of the photo business, which is exhilarating for me. Sometimes I stumble and fall, but most people are patient and a complete pleasure to work with. I am learning to streamline the process and am now able to offer more product services than a year ago. And, of course, I continue to take time behind the viewfinder–my most favorite place to be these days, especially outdoors on a wildlife or sports shoot. Moments spent with the camera are “precious and few” to quote an old song. I am excited to discover what the New Year will reveal for me photographically. I am looking forward to new opportunities and new learning! Yes, 2010 was a great year, but I believe 2011 is going to be even better! Twitter is a neat social media application that allows you to share information with others and also follow the happenings of other people/businesses you might be interested in following. Each message must be short–140 characters or less. There are many people connecting with each other tough Twitter every day. The text and photos down the left and right sides are what I added to spruce up my Twitter page a bit. It was fun to do and now my page reflects a similar look and feel to my website. I hope you are “tweeting” the official term for sending messages through Twitter. If you are tweeting, follow me and I will follow you! These and many more reasons keep me excited and motivated to be out photographing wildlife. But two weeks ago was a poignant example of another good reason to be involved with wildlife photography: the connections we make with other photographers. Our first night up on the elk range we were photographing a small herd of elk at dusk. We had just seen 4 bear, some turkey, a few deer, and a hawk. The action was fast and furious at times. Elk sightings were slow, however, until we saw this small herd of cows and calves. We photographed until we ran out of light and then we got to meet Brad Myers and his son Shane. We talked about our passion for photography and I enjoyed comparing notes with two other serious wildlife photographers. Little did I know how connected we would be later in the week. Thursday morning, August 20th was the day the bull elk got caught up in the swing set. Brad and Shane were the first ones on the scene and reported the incident to the Game Commission. 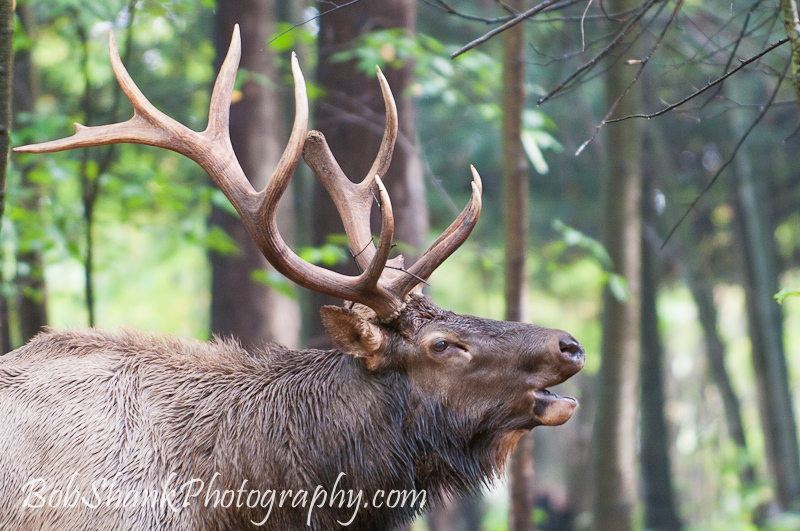 We joined them, set up our tripods and captured many photographs of the elk rescue. When the excitement was over we continued to talk and it was obvious to me that these two fellow wildlife photographers knew their stuff. I count it a pure honor and privilige to have met these two guys. That morning Willard Hill was also there videotaping the rescue. I had emailed Willard earlier in the year, thanking him for producing the 2-part DVD entitled, “The Truth About Pennsylvania’s Elk Herd.” I had the opportunity now to meet Willard in person. The next day my son and I ran into Willard again as we were photographing some elk and we talked for a long time. It was my pleasure to meet Willard in person and hear some of his perspectives on the elk herd and talk about wildlife photography with him. Friends in our lives sometimes come and go. Recently I re-connected with my best friend from back in my school days. I hadn’t talked with him in about 23 years. It has been so much fun to re-connect with him, catch up, and chat about old times. These friendships need to be valued and nurtured. Our photography connections are the same. We can learn a lot from each other and can have a lot of fun sharing this passion we love so much. Far too many people believe that photographers are more like competitors than colleagues. Not me. I am always eager to meet new photographers, learn from them, and share what knowledge or insights I have about something. These photography connections are special and I am humbled when I think of all the incredible photographers I have met over the years. There is one example of this that stands out in my mind. Several years ago I was waiting at the edge of my favorite spot by a field when I heard some people coming. My first thought was, “Oh no, I’m not alone anymore.” I heard a voice politely asking me if it was okay for them to join me. I said, “Sure.” Then I realized that one of the gentleman was a man I knew and he introduced me to Leonard Rue III, and his son Len, Jr. There I was, quietly waiting alone for the elk to appear in the field but now found myself in the presence of two of the most published wildlife photographers in the world! I sat there for the next three hours hearing one incredible story after another. Leonard and his son were two of the nicest and most down-to-earth people I had ever met. They shared their passion for photography with me and answered every question I asked. Some nights when I am waiting for the elk or deer to appear, my mind drifts back to that night. I then I secretly hope that I won’t be all alone there on the mountain much longer. The connections we make in wildlife photography are surely to be treasured! Facebook, Myspace, Twitter, blogging, and email all allow us to stay connected. It is a great age that we live in these days because we can connect with people literally across the entire world. And we can stay connected thanks to all the social media that is available at our fingertips. I was first introduced to Myspace a couple years ago. I created a page for myself but did not really see what the hype was all about. Then someone introduced me to Facebook and it all started to click for me. Not only could I share something about myself with others, but friends who I haven’t talked with since high school days were now only a mouse click away! In fact, just tonight I receive a Facebook message from on my very best friends who I first met in kindergarten. We were best buddies all through school and hung out together all the time. We were typical teenagers, talking about cars, sports, and girls and we were always there for each other. After graduation we went in different directions and lost touch. Now, after 25 years I receive a Facebook message from him. Amazing! Social media is also helpful in sharing our photographs, too. My Facebook page also includes the content of this blog and allows me to share my photographic endeavors such as my current photo exhibit, the Photo Walk I led, the Pennsylvania elk photography experience that I co-lead, and more. Utilizing the social media can help us share our photos with others and keep us connected. Do you have a Facebook page? Check out mine here. I heard about Flickr awhile ago. Other social network media took priority for me and I paid little attention to Flickr. I concentrated mostly on Facebook and really enjoy this way of reaching out to others. This changed last night. Following our Photo Walk when we were sitting down and talking with one another at Dansbury Depot, the suggestion was raised to create a Flickr page so we could post and share our photos with each other. I like the idea and decided to give it a try. Besides, the others made it sound pretty easy. So today I created my Flickr profile and was off and running… well walking maybe. It took me a little while but it seemed to work and I actually understood most all of the steps. Then I discovered how to create a group so the participants could post their photos. And guess what? It actually worked! Check it out and let us know what you think about the photographs. Are you on Flickr? If not, considering doing so. I can speak from experience that it is not difficult to do and there are many benefits. Hello, Flickr! What do you want to get out of photography? Are you interested in producing beautiful works of art? Is your goal to make money doing something y0u enjoy? Just what are you looking to accomplish with your photography? Photographers are artists, it seems to me. We see what others overlook or don’t bother to notice. Our creative tendency could be a goal in and of itself. I imagine there are as many goals possible as there are photographers. We are unique and yet we share a unique commonality at the very same time. Competition drives many in the field of photography. We view another photographer as a competitor and sometimes even as an enemy, rather than a colleague. When we hear about or meet a fellow photographer who is in our territory we look the other way and hope they will fail quickly. What if we took the time to learn from each other? What if instead of behaving like rivaling siblings, we showed a little mutual respect and friendship toward one another. I am rather tired of this doggy dog world where everyone is out only for themselves. Some of my photography goals are to extend and experience some feelings of camaraderie and collegiality. I readily recognize that I do not know everything about photography. My passions and interests have taught me a lot, but there is so much more for me to learn. And I know that I can learn a lot from fellow photographers. Isn’t there room in photography for genuine sharing and respect for each other? Can we not all learn a little bit from one another and have fun in the process? Isn’t it time we showed one another some mutual respect and even appreciation for each others work? Are you on Facebook? Do you have a Facebook page? Facebook is one of many social networks that is attracting attention. It is the amazing how many connections you can make literally across the world. My Facebook page contains connections including relatives, friends, schoolmates, church friends, and colleagues. I can now keep up with people who I haven’t heard from in many years. It’ great! I find it fascinating that far too many of us barely know our next door neighbors, but we have over 100 friends on Facebook. Just goes to show that the world is definitely changing. Many teenagers and young adults are using Facebook every day. They text message each other and share all kinds of information electronicially. They are using social media networks to the fullest. Does anyone you know use an iPhone? I have an iPod that I received as a gift after I saw how great my kids’ iPods were. Now I listen to the music of my choice and I listen to many podcasts. My social network is growing slowly but surely. I do have a Facebook presence and I am learning how to add to it more and more every day. You can check it out here. If you don’t have a Facebook page yet, you really should consider adding on. It is a great way to connect with other people! Scott Kelby is hosting the 2nd Annual Worldwide Photo Walk on July 18th. At first I wasn’t sure what a Photo Walk was all about, but then I decided to do a little research. A Photo Walk is basically a gathering of photographers who walk a identified route and take photos as they go. The event is casual and mostly a social gathering. However, photographers will learn from each other and get a chance to see how the “eye” of other photographers see possible photographs. I decided to apply to be a potential walk leader by listing my photography leadership experiences. This morning I received approval to be a Photo Walk leader in Stroudsburg/East Stroudsburg. Then I started working on developing the web page for the walk. It was all fairly easy and having already used WordPress for my own photo blog proved to be helpful.